A Birthday Gift From The Other Side! Today is my mother’s birthday and I was planning to see her over the weekend. During that time I was going to give her a gift and I wasn’t planning on sending anything in the mail. However, I was woken up by a message early this morning (around 8:30am) that told me to buy her a dozen roses. I saw the image of the roses in my mind — and “knew” that this was her best friend who had passed a few years ago. She has come to me several times over the past few years, but with no urgent requests such as this. Along with the image came the message to send her roses and to add her name on them. I was thinking, “Ok, this is going a little too far!” I didn’t feel sending my mom flowers with her best friend’s name on them who is deceased would be appropriate for her birthday. The last thing I would want would be my mother getting upset or sad on her birthday! Plus that would be a little strange. I was fighting this message, but it was so clear. So then, she said, “Don’t put my actual name on it, write that they are from “Sophia”. Now this was getting even weirder. She wanted me to put a name on there that made absolutely no sense? I knew that my mom and her best friend had nicknames for each other back in high school, but I didn’t know what they were. They had been friends since there were very young. So, reluctantly, I ordered the roses and wrote a card along with the message from “Sophia”. If, by chance, my mother got confused by this message, I could always come up with something! This protected me from saying they were from her friend on the other side. It just seemed too over the top, even for someone like me! I love roses, but am really not a fan of sending red ones. When I inquired if they had any additional colors, they told me there had rare green roses in the shop! 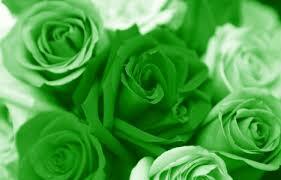 I had never seen green roses, but the shop owner said they were absolutely gorgeous, so I said YES. So about an hour ago, I called my mom to see if she received them. She had just gotten them as I called and was reading the card. She read the part about “Sophia” and said, “Who’s Sophia?” Ok, now I know I was just out of my mind and had to come up with something. But she just bypassed it and read the rest of the card without much to say. So now I had to know! I said, “Mom what did you and your best friend call each other growing up?” She stopped for a few moments, and had to spend some time recollecting. She said, “I remember we used to call each other by the names of two Italian ladies.” I said, “Was it Sophia?” And then there was silence. She gasped, “Yes! We were Angelina and Sophia”!